The Frame: I heard the story I’m about to relate as it was happening, from people inside the building speaking off-the-record to an outsider. I wasn’t in a position to find out more at the time, and I liked the Story-Of-It-All so much that I haven’t tried to follow up and find out what, if anything, people eventually learned about how this happened! Maybe by posting this I’ll discover the Truth, but I admit I’m pretty happy with the mystery . . . . The Story: A couple years ago, the Redmond Microsoft campus had an unprecedented security problem. I say unprecedented, but technically that may not be true if you watched Seinfeld. As part of the deal that brought Skype to these shores, Skype employees were provided with breakfast on the Microsoft campus. It was part of the contract. Many people took advantage of the perk. And then the Skype-breakfast muffin tops started disappearing. Not every day, but often, the tops of the muffins were gone. Eaten? Disappeared, in any case. No one came forward to take the credit. The muffin-topping continued. Take that, Skype! So people started taking steps, including setting up cameras. That didn’t work. Which started seeming weird. I’m not sure how seriously anyone was worried about it, but there were impromptu patrols by semi-concerned employees. The last I heard, a patrol thought they had found a woman acting suspiciously in one of the kitchens, but when she realized they were fairly crap vigilantes, she just walked away and no one figured out who she was. It’s not only GenCon’s 50th birthday this year; it’s my wife Lisa’s 50th, and they coincide. So I won’t be at GenCon this year. I’m sorry to miss out on seeing friends I only see once or twice a year, but I have no complaints, it’s going to be a great birthday! There will be several games and things I’ve designed or contributed to showing up at the convention. 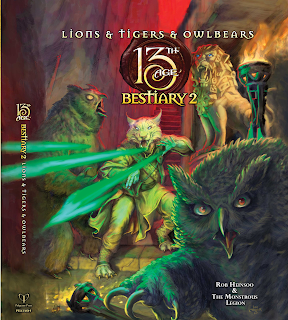 First, at booth #1317, Pelgrane Press will have copies of Lions & Tigers & Owlbears: 13th Age Bestiary 2. I haven’t seen the physical book yet so if you get a copy you’ll be ahead of me. You should be able to find authors like Wade Rockett, Gareth Ryder-Hanrahan, and Jonathan Tweet at the show and often at the Pelgrane booth. Artist Naomi VanDoren (Purple Dragon, kowha, etc.) will be in the art show. Speaking of art, Campaign Coins has repackaged the 13th Age icon tokens with a color backing card. They're up for an ENnie and they'll be on sale at booth #842. Pelgrane panels will also be discussing the next few 13th Age books in the pipeline. One of them, the Book of Demons, contains the new demonologist class, which is presently being playtested by former 13th Age Monthly subscribers and which I’m working on more this week. And speaking of playtesting, Arc Dream Publishing will have playtest decks of the Wrestlenomicon card game I designed the mechanics for at booth #431! I'm happy with mechanics I’ve never seen anywhere else that capture a wrestling match between gigantic elder gods! It helped to have card art finished by Kurt Komoda and hilarious/devastating card names provided by Dennis Detwiller and Shane Ivey. I got to focus on carving mechanics to live up to the art’n’concepts. The game is going to have a wider public playtest you can sign up for on the Wrestlenomicon site, and then a Kickstarter. Meanwhile over at the Chaosium booth, #829, they’ll have the first three laid-out chapters of 13th Age in Glorantha. 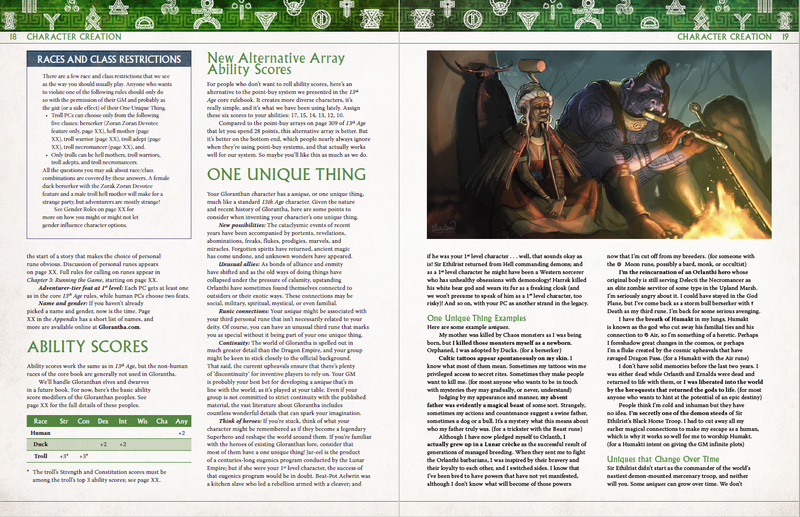 Chris Huth, the layout artist responsible for this design, is taking a break from layout to attend the show, where he’ll be running games and working at the Pelgrane booth a bit. You can see more samples of the layout in this update on the 13G Kickstarter page. More coming in a later post . . . .